AUCTION DATE: THURSDAY September 17, 2015 | STARTING @ 11:00 A.M.
Cincinnati 175 CBx12 175 Ton x 12’ Hydraulic Press Brake s/n 42736 w/ Controlled Back Gaging, 8 ¾” Throat, 151” Between Uprights, 12’ Bed Length, Foot Control. Wysong mdl. 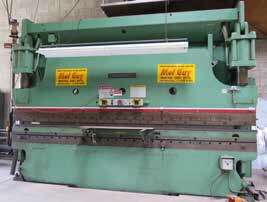 1225 ¼” x 12’ Power Shear s/n P28-294 w/Controlled Back Gauging, 132” Squaring Arm, 25 ½” Front Supports, Foot Control. W.A.Whitney mdl. 615-A Manual Duplicator Punch Press s/n 615-250-36615 w/ 36” Throat, Punch Heads and Punch Die Toolig. 60” Power Roll w/ 5” Rolls. 1994 Borschert Type LB12 6” x 6” Power Corner Notcher s/n 2052 w/ Pendant Controls, Fence System. Pexto mdl. G-52-A 16GA x 52” Foot Shear s/n 9/62 w/Back Gage, Front Material Supports. Chicago Size 416 16GA x 48” Hand Brake s/n 55814. Whitney-Jensen mdl. 414 48” Finger Brake s/n 651-366. Pexto mdl. 381D 22GA x 36” Slip Roll s/n 52 w/ 2” Rolls. “By George” Reliance Tool mdl. CS245273 52” Power Circle Shear s/n C27833 w/ Stand. Pexto mdl. 299-C 20GA Cap Circle Shear s/n 10/73 w/Stand. Rotex mdl. 18AK18 18-Station Turret Punch s/n 13868 w/ Shear Station. W.A.Whitney mdl. 606052 18 Ton Hydraulic Shear s/n 606-052-19921 w/ Cart. Lockformer 20GA Cap Roll Former s/n 208311. Pexto mdl. 0617-A Power Beader/Crimper s/n 10/64 w/18GA Cap, 12” Throat, Assorted Tooling. Whitney 2.5” x 2.5” Corner Notcher. Emco Maximat mdl. V10-P 9 ½” x 25” Lathe / Milling Machine w/ 26-2500 RPM, Inch Threading, Tailstock, 5” 3-Jaw Chuck, Maximat-7 Milling/Drilling Head w/ 420-1740 RPM. Rockwell mdl. 20 20” Vertical Band Saw s/n 1728417 w/50-4500 FPM. Rutland 6” Belt / 9” Disc Sander. Campbell Hausfeld Portable Air Compressor. Welding :Lincoln Idealarc TIG-300/300 AC/DC Arc Welding Power Soiurce s/n AC176866. Miller CP-250TS CP-DC Arc Welding Power Source s/n 71-597917 w/ Millermatic 10A Wire Feeder. (2) Lincoln Lincwelder 225/3-AS Gas Powered DC Arc Welder with AC Generator s/n’s A-8077732, A-514180. Western Arctronics mdl. 30KVA 30kVA x 24” Spot Welder s/n DD530. Acme Type 1-24-20 20kVA x 26” Spot Welder s/n 8761. 4’ x 6’ Welding Table. Clark mdl. C300-50 4450 Lb Cap Gas Forklift s/n 356-97-5146583 w/ 188” Lift Height, Solid Tires. (3)Cantilever Sheet Stock Racks w/ Misc Materials. Dayton 500 Lb Cap Electric Hoist. Benwil mdl. TP-7 Hydraulic Car Lift. 1964 ½ Ford Mustang Lisc# OVT809 Very Rare “K” Code High Performance Custom Factory Vehicle w/289 Cobra Powered 271HP High Performance Engine, 4-Speed Manual Trans, Original Matching Numbers, All Original Black Interior, “Rally-Pac” Gage Package on Steering Column, Plaque on the interior reads “This Car Made Special For Robb Briggs”, 63,560 Original Miles, VIN# 5F07K162536. 1996 Dodge Ram-1500 Laramie SLT Sport Pickup Truck Lisc# 5G86769 w/ 5.9L V8 Gas Engine, Automatic Trans, AC, Cruise Control, 98,148 Miles, VIN# 4B7HC-13Z6TJ149036.